When you look at the shade of green on these eye-catching return address labels, you'll inevitably start thinking about one thing ...cold hard cash. Of course, the color green can represent many things. New life, the spring season, alternative energy, the list goes on. But it is money that makes the world go 'round. You'll love how these labels look on your letters and packages. But they're more than just a flashy finishing touch. You'll save a ton of time preparing outgoing mail because they are also self-adhesive. And you know what they say...time is money! 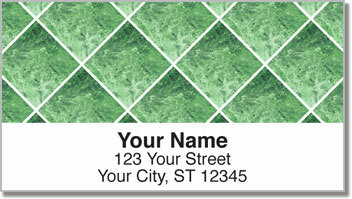 Order your own Marble Tile Address Labels right now! Get them with a set of matching personal checks.